Visitors from around the world can now leisurely savor China's traditional architectural beauty at the Imperial College in Beijing, about 400 years after the first foreign students were sent there to sit tough Chinese exams. 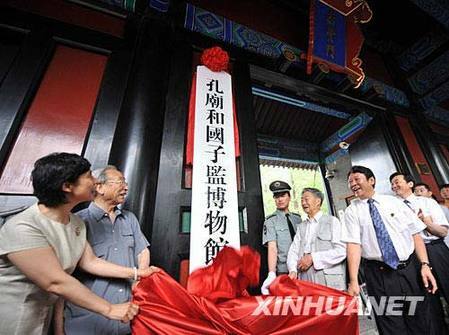 The school and the adjacent Confucian Temple were formally re-opened on Saturday after three years' renovation. The massive project, which cost 20 million yuan (2.9 million U.S. dollars), was the most extensive in the past 50 years. During the overhaul, many chambers were closed to visitors. The project aimed to reinforce and repair the centuries-old structures while keeping them "as original as possible," said Yu Ping, vice head of the Beijing Municipal Administrations of Cultural Heritage. "We did not repaint the ancient patterns on the beams or remove the faded glazed tiles on the roofs because we do not want to lose the antique flavor," she said. After the face-lifts, the two sites are now basically what they were in olden times, in terms of the layout and scale, Yu added. "The temple, which looks very authentic, is what I expected to see here in China," said Vishal Shorma, a Singaporean tourist. The Imperial College, or "Guozijian" in Chinese, was built in the early 14th century and served as the highest learning institution and education administration during the Yuan (1279-1368), Ming (1368-1644) and Qing (1644-1911) dynasties.